The green roof system reduces heating inside the home or building by up to 30-40% making it a natural air conditioner. Green roofs are found in 20% of the homes in Germany. Recently, the home made green roof system developed by John Wilson has been upgraded to include swales for water collection where we are starting to grow some herbs. If you are interested in more information about this green roof system, please contact john.wilson@thesolarvillage.com and join the Solar Village community online. The award winning Wilson Natural Home above uses a green roof to both cool in the summer but also to improve insulation levels for improved warmth in the winter. The six inches of soil and several layers of membranes significantly increase the insulation levels in the roof which is a major contributer to heat loss. The use of green roofing replaces soil that is displaced during construction. The return of native plants to the construction site returns the health of the local environment. Green roofs have been proven to significantly reduce the heating effect typical of homes, buildings, cities and towns caused by their dark roofing materials that absorb and then radiate heat into the local environment. Plywood layer on top of roof trusses or joists (some slope is required for drainage, too much slope may be difficult to cultivate due to erosion). Apply a synthetic rubber membrane on top of the plywood roofing structure. Up to this point you have basically created a common industrial roof. In order to retain the soil the roof must provide a containing edge from four to eight inches high, also covered by synthetic rubber. Don't forget to leave some drainage scuppers. Once the base roof water proofing system is in place the additional green roof components can be added when ready. The first layer of the green roof is typically a foundation membrane (a dimpled "Delta" membrane or something similar that can catch and retain some water in the little cups. Add a landscaping root barrier membrane. Apply the all membranes from bottom to top and ensure layers overlap with upper (higher) layers on top of lower layers. (The same way you shingle a house). 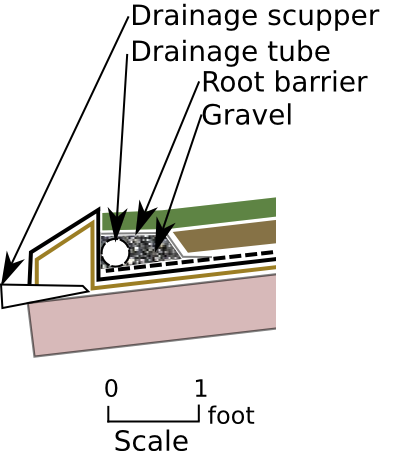 Around the drainage zones create a drainage area as you would around the foundations of a house, with gravel and drainage tubing. Fill in with soil from four to six inches. Use straw mats tucked under the soil to reduce erosion as the soil begins to grow plants in it. Check out www.GreenRoofs.com for more information. Please submit your open source ideas to add to our collection.